2013 Buick Encore Pros and Cons: Why (Not) This Car? The 202-by-79-by-70-inch Buick Enclave is among the largest crossovers. Seeking to transport up to eight people and their stuff in a modicum of luxury? It could be your best bet. For personal use, though, many people might find the Enclave...excessive. After all, how much vehicle do you need to run a kid or two to school and do the weekly shopping? Buick's answer: much less. Its second crossover, the Encore, is among the smallest, with dimensions of 168 by 70 by 65 inches. With a 138-horsepower engine, it's also among the least powerful. Due to its small size and semi-premium positioning, the Buick Encore has no direct competitors. Casting about for the closest match, I settled on another Korean import, the Hyundai Tucson. A decade ago, hardly anyone would have considered Hyundai a potential Buick competitor. But much has changed in the past decade. Need proof? Buick, long-time purveyor of big iron, fields the smaller vehicle in this comparison, and not by a matter of tenths. Though about as compact as compact crossovers get, the Tuscon is about five inches longer and two inches wider than the Encore. Even given American's increasing acceptance of "right-sized" luxury, has Buick (driven by an intense focus on the Chinese market) perhaps gone too far to the other extreme? Why the 2013 Buick Encore? In the past, small vehicles were almost invariably rough and noisy. For a Buick, and especially for a small one aspiring to be considered an upscale vehicle, this wouldn't do. Like the brand's new compact sedan, the Verano (reviewed previously), the Encore is very quiet inside, even at highway speeds. The Tucson, though not noisy, is noticeably noisier. With a higher center of gravity, a crossover is never going to ride as steadily or as smoothly as a car. But, despite its short 100.6-inch wheelbase, the Encore rides well for the genre. The Tucson has a significantly longer, 103.9-inch wheelbase, yet rides much more busily. You'll experience considerably less jostle and jiggle in the Buick. Rear pillar a bit busy, with extraneous crease and aero-enhancing black applique. Too many buttons, distant screen. The Encore looks the part, its cute organic shape tastefully adorned with upscale details. I personally don't care for the windowline-extending, aero-enhancing black applique that clutters up the rear pillar, but most people aren't bothered by such things. Cladding in a second, darker tone (in this case brown) effectively disguises the Encore's height. The warm ambiance and tasteful luxury continue inside, especially with the available saddle-and-brown upholstery. You can also get saddle leather in the Tucson, but the rest of its largely black interior doesn't appear as artful or as upscale. This said, the Buick's interior includes one questionable element. Plentiful, overly glossy plasti-wood trim is too obviously not the real deal. The Encore's upscale appearance is backed by upscale materials. The larger, much more expensive Enclave should be outfitted this well. Just about everything from the body structure to the controls feels solid. With front-wheel-drive, the Encore earns EPA ratings of 25 mpg city and 33 mpg highway. Add all-wheel-drive (as on the tested car) and these figures drop to 23/30. Given the Encore's small size and marginal power output, better might be expected. The BMW X1, with another 102 horsepower, somehow manages 22/33 on the EPA test cycle. But the BMW's ratings seem a bit iffy. I had a much easier time meeting and exceeding the Buick's EPA ratings. At a steady 70 on the highway I averaged over 31. In suburban driving the trip computer regularly reported averages in the low 30s, even 35. To average over 30, though, you can't have too many stops or too heavy a foot. Put the pedal down hard, and the small four-cylinder engine's turbo will enable it to gulp air--and fuel--like a much larger one. Drive with little care for fuel economy, and 25 will happen. Which is still better than the EPA rating. The Tucson is among the oldest designs in Hyundai's line, and doesn't have the firm's latest engine technology. Consequently, its EPA ratings are a dismal (for a compact, 176-horsepower vehicle) 20/27. The current compact crossover champ, the Mazda CX-5, manages just a little better than the Encore, 24/30. 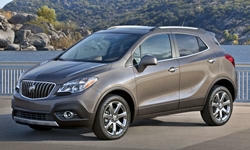 Why Not the 2013 Buick Encore? Now we get to the things not likely to earn the small Buick an encore. The crossover might be small, but at 3,300 pounds (with AWD) it's as heavy as the larger Tucson. The 138-horsepower 1.4-liter turbocharged four-cylinder engine, optimized for low-end torque, manages this weight well enough in casual driving around town. But need to merge onto a highway or pass on a two-lane road and the small engine's lack of top-end thrust becomes painfully apparent. When pushed, the Encore feels underpowered. With all-wheel-drive it takes about ten seconds to get to sixty. The Hyundai Tucson, with a 176-horsepower 2.4-liter engine, gets to sixty about a second quicker. A Buick ought to be quicker still. Perhaps the 250-horsepower turbocharged 2.0-liter engine optional in the Verano sedan can fit? From the neck down, the Encore's high-mounted, cushy-yet-firm seats deliver comfort congruent with its mission. Some people also won't have a problem with their design from the neck up. Others will find the headrests uncomfortable and too far forward. Given the Encore's compact exterior, it should come as no surprise that even the more-compact-than-most-compact-crossovers Tucson has a few more inches for both shoulders and legs. But the Buick nevertheless has enough room inside to comfortably seat four good-sized adults. It helps that the rear seat is comfortably high off the floor and that there's a lot of room for the rear passengers' feet beneath the front seats. Children, especially those who've outgrown boosters, will have more to complain about. They'll easily fit, but their view outward through the small, high rear side windows will be limited to the treetops. Though the front seats in the Tucson aren't as comfortable as those in the Encore, with a less luxurious feel and less supportive side bolsters, their headrests aren't overly intrusive. Rear seat passengers won't find the cushion as comfortably positioned, but small ones will have a somewhat easier time seeing out its side windows. Buick identity clearest from this angle. Good height and decent room, but small, high windows. Shift your attention to the Encore's instrument panel, and you'll experience a different sort of discomfort. As in other Buicks, far too many poorly arranged buttons fill the center stack. It's far from clear what some of these do. I'm also not a fan of how turning off the audio system also turns off the nav. The Intellink infotainment system, easier than most to operate in other GM cars, isn't so easy here. The screen is too far away to reach, and so isn't a touchscreen. Instead, you must use a four-way-rocker-plus-knob control in the center stack to navigate among its large icons. The Hyundai's controls are easier to understand, but those along the right side (especially the radio tuning knob) are too much of a reach to safely operate. But some features commonly expected in an upscale car aren't offered in the Encore. With LED headlights the latest thing, you can't even get Xenons in the Encore. You can't get into or start the car without removing the key from your pocket. The feature I personally missed most is relatively low tech. As in the Verano sedan, the seat recliners are manual. With even the long-in-tooth Tucson offering a proximity key and power reclining driver seat, and the Mazda CX-5 offering both and xenon headlights as well, the Buick's feature offerings are well behind the curve. With the Encore's rear seat up, there's only enough space for 18.8 cubic feet of cargo--and that's if you load it to the ceiling. Fold the rear seat to yield a low, flat floor, and cargo volume expands to 48.4 cubic feet. While both figures are below those for the Tucson (25.7 and 55.8), and far below the compact crossover average (somewhere around the Ford Escape's 34.3 and 67.8), they're sufficient for at least 90 percent of people 90 percent of the time. Long objects can be accommodated by folding the front passenger seat, a feature Hyundai has deleted from the Tucson. Around town, the Encore doesn't feel especially agile or sporty--it's no MINI Countryman--but it does feel sufficiently athletic and well-controlled for a vehicle without performance aspirations. Its steering feels more naturally weighted than that in the Tucson. In hard turns, though, there's more lean than in the Hyundai. Quick lane changes at highway speeds similarly betray a suspension optimized for ride quality. The tested 2014 Buick Encore lists for $32,230. A similarly loaded 2014, with its additional safety features, will list for $33,180. Seem steep for such a small, marginally-powered crossover? Well, the Hyundai Tucson doesn't offer the safety features included in a top-trim Encore. Step down to the Encore's Luxury Group (but keep the BOSE audio system), drop the $995 chrome-clad wheels, and add a sunroof to more closely align the two models, and the Buick is only $250 more, $31,150 vs. $30,900. Adjust for feature differences, and the Buick is about $1,450 less than the Hyundai. So its price isn't nearly as out of line as my sense of how much crossover $30,000 can buy. Drive the new Encore, and the idea of a subcompact luxury crossover--from Buick--doesn't seem so far-fetched. The styling, materials, ride quality, and quietness befit the brand. There's not a lot of interior space, but four people can travel comfortably as long as none are extraordinarily large--and as long as the headrests don't conflict with their physiques. Performance and the lack of power recline are other potential deal killers. But if none of these bother you personally, and you'd like a luxurious-yet-economical crossover, then the Encore could be all of the car you need, or even want. Efficient, but slow by current standards. Low, nearly flat floor. Even the front passenger seat folds. Buick provided an insured car for a week with a tank of gas. Suburban Hyundai of Southfield, MI, provided the comparison car. 2013 Buick Encore pros and cons, according to Michael Karesh: the best reasons for buying (or not buying) the 2013 Buick Encore. Join TrueDelta to post your own impressions. See TrueDelta's information for all Buick models.